WINAICO is a global manufacturer of high-quality solar panels. WINAICO’s office in the UK was founded at the beginning of 2011 and the company is currently expanding its presence across the country. What sets WINAICO’s solar panels apart boils down to 2 main things: the quality of the components used, and the strict quality controls used in the company’s manufacturing process. The components used in WINAICO’s solar panels are chosen selectively by the company to be among the best in the industry. The companies partnered with WINAICO Solar are all leaders in their respective fields: Saint Gobain makes the glass, Bridgestone and DuPont make the foils and backsheets, and WINAICO Solar’s parent company is Taiwan’s Win Win Precision Technology makes the silicon cells used in the panels. Having got its start in the semiconductor industry, the company knows what sets quality silicon apart from low-end silicon, and has applied this knowledge to its solar cells. The quality of the components in the panels is monitored and checked at every stage of the manufacturing process. Incoming components first undergo a check before being assembled into modules, and the rest of the production process is subject to 100% visual, micro-optical, mechanical, and electrical testing before leaving the factory. The company confidently declares that it offers a ‘perfectly assembled’ photovoltaic module made with the best components available on the market. WINAICO also manufactures lines of laminates, thin-film panels, and roof-integrated PV systems. -A linear performance warranty of 25 years. The industry standard is a ‘stepped’ warranty–solar panel efficiency is guaranteed to be at least 90% of its rated output for the first 5 years of a panel’s operational lifetime, and then 80% for the next 15 years. A linear performance warranty ensures a higher degree of specificity about a panel’s performance: efficiency will not fall below 97% in year 1. 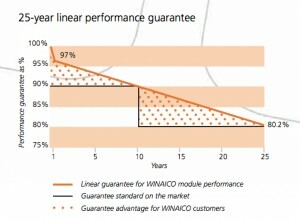 For the following 24 years, WINAICO guarantees a maxium drop in performance of 0.7 % of nominal performance per year. -12 year product guarantee for WSP-series. This guarantees the panels against any structural, electrical other types of flaws for the first 12 years. -Positive power tolerance of +0/+5 watts: WINAICO solar panels will perform at least to their nameplate capacity or up to 5 W more than that. Compare this to many companies whose power tolerance is -3/+3%. -WINAICO Solar panels have shown excellent performance on Photon Magazine’s Solar Module Yield Measurement test–regarded as the most rigorous and thorough 3rd party testing authority in the solar power industry. WINAICO WSP-235PG 235W panels came in 7th place of 130 modules; WINAICO WSP-230P6 230W modules ranked in 21st place. Parent company information: Win Win Precision Technology, founded in 2003 in Taiwan. Win Win is involved in the manufacture of LED lighting products, as well as the development and production of semiconductor manufacturing technology for use in crystalline PV modules.